Here at Potluck we know a few things about content creation. I mean, that’s literally what we do. Also drink coffee and send ridiculous Airdrops to the next-door office, but mostly the content creation thing. In an average week we can create over 100 separate, unique, bite-sized pieces of content. 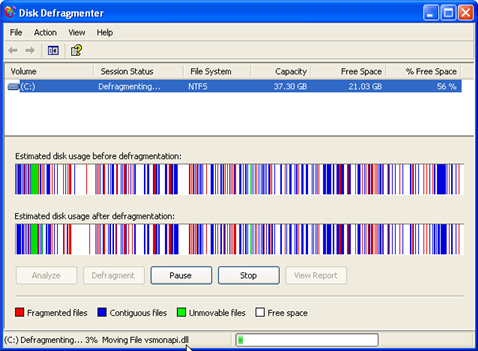 We aren’t joking about the crazy part – our brains used to end up chopped into dozens of pieces, like those Windows XP defrag screens, by the end of the week. But desperation is the mother of invention, and so we developed a secret weapon to keep the crazy at bay. Another random fact about us here at Potluck: we get obscenely excited by a good spreadsheet. Not even kidding. Introducing the Social Media Editorial Calendar! Now, this is top-secret stuff, so only keep reading if you love puppies and/or are serious about your social media strategy. We build editorial calendars for everything around here. Social media. Blogging. Email newsletters. Publication schedules. Summer vacations. Next week’s menu. (Only sort of kidding.) And I’m going to tell you how we do it. While you are at this, you may as well do it right. So let’s walk through building a month-long editorial calendar, right here. Open your favorite spreadsheet software. We use Google Sheets for our editorial calendars, because they are easy to share and update. 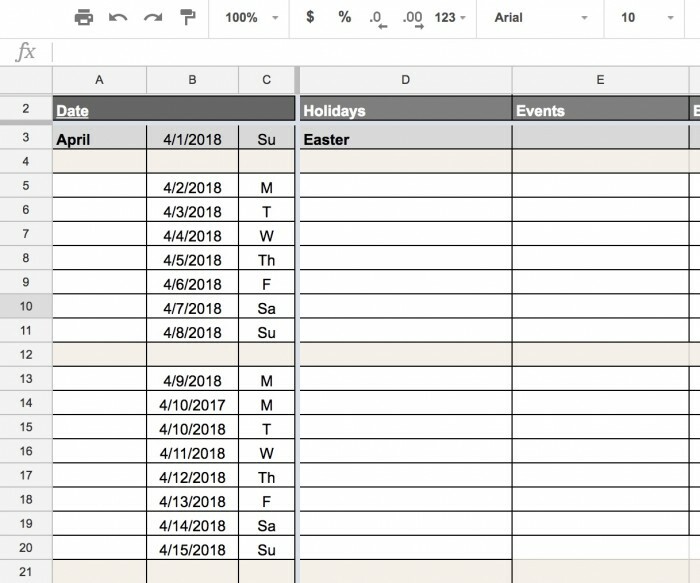 Create a header row, label the first column “Date,” and start putting in the time-sensitive stuff that affects your strategy. For instance, if you are a venue, you will have a column for “Events.” Include one for Holidays, Sales, Blog Posts Release Dates, etc. as appropriate. Anything that you plan ahead for, anything at all that could go on a calendar, you’ll need a header for. Done? Great! Now add columns for Themes, Topics, Proposed Copy, Notes and anything else you like to include in your content. Now you are going to fill in the dates under the “Date” column. Every day of the month gets its own row. Pro-tip: Type in a couple of dates, then highlight those cells, then double click the square icon on the highlighted cells. This will auto populate the entire column with the dates! Ready? This is the fun part! Fill in the easy stuff first. If you are planning April, then put “Easter” under the “Holidays” column on April 1. Do the same with any relevant holidays in the month, any events you might have planned, any sales coming up. Next, let’s get creative. Do you have any recurring themes in your marketing? These could be categories like “Relationships,” “Home,” “Garden,” or they could be more abstract: “Equality,” “Love,” “Resistance.” Think outside the box(es)! Then fill in the boxes; assign each week of the month a theme. Getting more specific, let’s move to the Topic column. Say that Monday April 2 you have a sale on dinglemawujits starting. Your theme for that week is “Treat Yourself.” The Topic for Monday might be “Why you deserve a dinglemawujit.” Make a note of any media the post might need, include the link you want to use, anything you’ll want to remember when you actually send this out. Note that you haven’t written any content yet. You are setting up a framework and jotting down ideas to fill in the blanks. Keep going, day by day. Incorporate holidays, events, blog posts and themes as you choose the topic for each day. If you get stuck on a day – can’t think of a good topic, or don’t know exactly how you’ll implement the one you chose – just move on. Do the easy answers first and then go back for the hard ones, just like those school tests always said to do. Tada! You have made yourself an editorial calendar. Now, when it’s time to create your content for each week? Half the work is already done for you. No more trying to dredge something up from scratch; you’ve got themes, topics, photo ideas and more at your fingertips. From here it’s literally drag-and-drop, then flesh it out and schedule. If this still feels like too much of a time investment, consider this: We spend less time creating an editorial calendar for an entire quarter than we would spend creating content for one week. And since we are doing all of the brainstorming at once, our brains can stay whole and (nominally) sane. So that’s how we create content without going crazy over here. Can you picture incorporating this into your own content creation flow? How would that look for you? Leave comments or questions below: let’s get this party started!